Adapted from Nach Waxman’s recipe in The New Basics Cookbook. 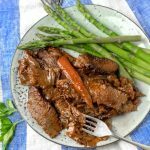 This brisket, coated with tomato paste and cooked with lots of onions, is exceptionally tender and flavorful, and the recipe is surprisingly easy. Equipment: A large heavy pot or Dutch oven with a lid. Preheat oven to 375ºF. Peel the onions and thickly slice them crosswise (not through the root). Put onion slices into a big bowl and separate them into rings. Set aside. Season the brisket on both sides with salt and pepper. Dust with flour on both sides. Heat oil in the pot over medium heat. Brown the brisket all over. If the brisket is larger than the pot, you’ll need to work with it, pushing it around and down into the oil and flipping it over and moving it, until you’ve got a nice brown color and crusty bits over most of the meat. Transfer the brisket to a platter and add the onions to the pot. Turn the heat up a bit and cook the onions, stirring often with a wooden spoon and scraping up the browned bits on the bottom of the pot, until the onions are golden brown but not yet caramelized, about 15 minutes. Turn off the heat. Place the brisket, fat side down, on top of the onions. Using a small butter knife or something similar, coat the the top and sides of the brisket with tomato paste, as if you were frosting a cake. [I sometimes use the whole can if my brisket is very large] Sprinkle with more salt and pepper, to taste. Tuck the carrot halves and garlic around the outside of the meat. Cover the pot and cook for 1 ½ hours. Pull the pot out of the oven and turn the oven down to 325ºF. Transfer the brisket to a cutting board. Using a very sharp knife, cut the meat across the grain, into thin slices. (see explanation in post about cutting across the grain) Carefully return the slices to the pot as if you are reassembling the brisket. Place your knife between each slice to make sure some of the liquid gets between all the slices. Slightly tilt the slices to one side to ensure they stay down in the liquid. Cover the pot and return it to the oven for another two hours, until fork tender. Check the pot once or twice during cooking. If it looks dry add 2-3 teaspoons of water. Brisket is ready to serve or it can be refrigerated for up to three days. Flavors only get better over time. * First cut brisket is sometime called flat cut brisket. It’s relatively lean but has a layer of fat on one side. That fat should be left on the meat as will help keep the brisket moist and tender as it braises. ** If you’re cooking Brisket for Passover, regular flour is not permitted. Substitute Matzo Meal. ***Freeze the brisket with onions and juices in an airtight container for up to 3 months. Defrost in the fridge overnight and reheat in a a heavy covered pot in a 325º oven for 40 minutes to an hour.